I was doing my daily pest/disease check and noticed these white, lint-like bugs near a colony of aphids. I thought I had another pest to worry about so I trolled the GardenWeb forums for some answers. It turns out they were not new bugs, just the cast skin aphids leave behind when they moult. When scouting a field, you will often find the white, cast skins left behind when aphids moult. They are often confused with diseased or parasitized aphids. If you are finding them on the top surface of leaves, take a look at the leaves just above - is there a new colony forming above? 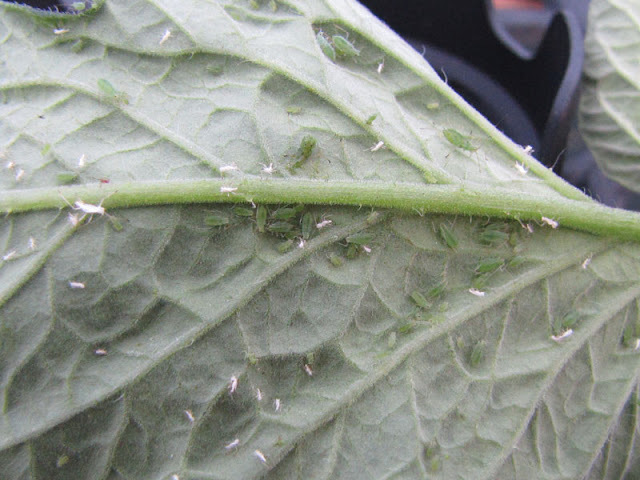 If you are looking at a colony of aphids on the underside of a leaf (where colonies form) and all that is left is behind are cast skins, then the aphids have probably developed into winged forms and migrated to another plant. I was relieved to find out that I did not have a new pest to worry about. Obviously I still have aphids, but they remain at manageable levels. Let this be a lesson to all you novice gardeners out there. If you see this on your plants the good news is you do not have a new pest to worry about, the bad news is you still have aphids and they're probably spreading to the rest of your garden.